There is a tendency for beginner artists, and even very well seasoned artists, to approach the artwork over tentatively. The desire to produce the best work possible results in an-all-too-careful attitude that shows in the finished work. Careful application of pencil, charcoal, poor paint makes for a 'careful' or timid looking painting and, frankly, there is nothing less interesting to the viewer than seeing an artwork by an artist that appears to lack conviction in what they are doing. There is no simple formula for building confidence and boldness in your approach to the artwork. One way is to look at the work of 'Action' painters such as Willem de Kooning (1904-1997) who clearly approached their work very physically, or to the work of Francis Bacon (1909-1992) who considered 'chance' as an artistic method. In the approach of the latter there is a clue as to how best to approach the artwork. The fact with a drawing or painting, as with life, is that no gains are made without a certain amount of risk; one cannot learn without making mistakes. It is better to throw caution to the wind and take the work in a whole new direction by adding a new colour or striking a new pencil mark across the page than by plodding along making simple repetitive sketch marks. This attitude perhaps turns things upside down somewhat for the beginner artist, who would like to believe that there was some sort of safe method that could be learned that would thereby ensure artistic success as every turn of the hand. It is simply not the case! Of course, there are instances when, to achieve a certain effect, procedures must be followed (see related articles for further information). However, even with relation to these exercises, a certain amount of flexibility will be required. The artwork does not so much get made by the artist, as it is made with the artist. This is because there are so many relative elements to a drawing or painting - tone, colour, line, form, etc - that with every application of paint or pencil (for example) the picture changes radically. These changes tend to lead the artist in one direction or another, and it takes real confidence to let oneself be led, whilst still maintaining the ability to produce a coherent finished artwork. One simple drawing exercise demonstrates the value of taking risks. It does require a certain amount of discipline and is one perhaps better conducted at the behest of a teacher or trusted friend. 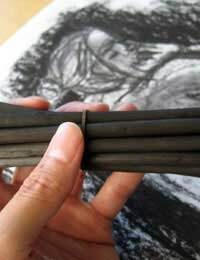 You can use soft pencil or charcoal: you will need one heavy graphite pencil or very soft pencil (2b, for example), or thick stick of charcoal, as well as any other selection of pencils/charcoal that you prefer. All the exercise requires is that you draw seriously and with conviction any particular scene that you especially interested in conveying (one that has particular relevance to your general practice would be good). Set yourself a time limit (say 10 minutes) and after that time, when an alarm sounds, or your friend tells you so, take your drawing, rip it in half and piece it back together again, using tape, with the bottom of the drawing at the top, and the top half at the bottom. Now scribble in heavy dark pencil, or charcoal over your disjointed image: all over it, in a random manner. Now leave it for a few minutes, before returning and seeing what you can now make out. You will in all likelihood see elements of your original drawing standing out, and you will also see many new marks and elements. Some of these marks will seem a dreadful nuisance, because they have destroyed your beloved picture, whilst others will be of interest, suggesting new forms. The results of a hard fight to 'retrieve' a lost image can often show in the final work, making for a bolder final result: This can be seen in the finished work of artists such as Frank Auerbach (b. 1931) and Leon Kossoff (b. 1926), who's reworked paintings and charcoal drawings show the marks of a struggle to capture the essence of their subject! Confidence can be built in this way by leading someone away from the tentative and clinging approach that leads so many beginners to produce weak and over careful works.